(Phys.org)—An international team of researchers has examined ice cores taken from an island in northern Canada in the 1980s and found that air temperatures during the Holocene were higher than today. Further, there have been unprecedented air temperature changes in the area over the past half-century. In their paper published in Proceedings of the National Academy of Sciences, the group describes their study of the cores and why they believe it may help better understand what might happen to our planet due to global warming. Prior evidence has shown that global warming is happening in different degrees in different parts of the world, and that the biggest changes are occurring in the Arctic. As the planet warms, scientists look for examples from the past to predict what might happen in the future. In this new effort, the researchers report that temperatures at the end of the last ice age (8,000 to 11,000 years ago) were slightly warmer than they are today, which suggests that other studies might show the impact that such high temperatures had on the rest of the planet. The ice cores were taken from the Agassiz ice cap on Ellesmere Island several decades ago, but were not thoroughly examined due to budget constraints. They now reside at a site on the University of Alberta campus, which allowed the team access for study. The cores came from depths as much as a kilometer, offering a look into the distant past. 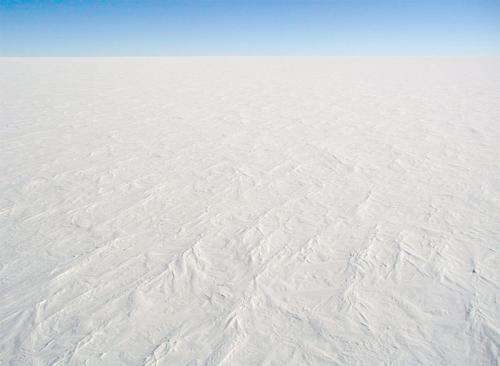 The researchers measured ice that had melted and subsequently refroze and oxygen isotopes to learn more about air conditions during the time of their formation. The team reports that they found matching results from the two measuring methods, which strengthens their findings. They also report that overall, their findings offer more evidence of global warming which, they suggest, is most certainly due to human factors—natural factors, such as those that led to a warmer world during the Holocene (variations in the Earth's orbit and tilt) occur at a much slower rate. The researchers suggest more research be done to look for changes wrought by the warmer conditions during the Holocene, both in the Arctic and other parts of the world, to predict what changes might be ahead. We present a revised and extended high Arctic air temperature reconstruction from a single proxy that spans the past ∼12,000 y (up to 2009 CE). Our reconstruction from the Agassiz ice cap (Ellesmere Island, Canada) indicates an earlier and warmer Holocene thermal maximum with early Holocene temperatures that are 4–5 °C warmer compared with a previous reconstruction, and regularly exceed contemporary values for a period of ∼3,000 y. Our results show that air temperatures in this region are now at their warmest in the past 6,800–7,800 y, and that the recent rate of temperature change is unprecedented over the entire Holocene. The warmer early Holocene inferred from the Agassiz ice core leads to an estimated ∼1 km of ice thinning in northwest Greenland during the early Holocene using the Camp Century ice core. Ice modeling results show that this large thinning is consistent with our air temperature reconstruction. The modeling results also demonstrate the broader significance of the enhanced warming, with a retreat of the northern ice margin behind its present position in the mid Holocene and a ∼25% increase in total Greenland ice sheet mass loss (∼1.4 m sea-level equivalent) during the last deglaciation, both of which have implications for interpreting geodetic measurements of land uplift and gravity changes in northern Greenland. We're still in the Holocene (regardless of what some wags write). And yes, the planet's current temperature is both warmer and cooler than it has been and this within historic times, not just the during the past 10,000 years. After all there were dairy farms in Greenland 1000 years ago, longer growing seasons in China during the same time periods as well. Interesting results of continuing research in historical climate events. Unfortunately, denier propagandists will use these headlines their lies that modern humans have no influence in environmental changes. Mammon's pimps proving that humans are no smarter than the dinosaurs had been. My explanation for the concept of human-caused climate change is the example of a side-by-side refrigerator/freezer combo. You keep messing around with the temperature controls while refusing to clean your dirt off the fans and radiator element. Too lazy to close the doors tightly, too scatter-brained to store food in an organized manner. The freezer overheats and the refrigerator freezes solid. Being too cheap to pay for the maintenance of your original investment in food storage. You now keep frozen goods in the reefer section and cold foods in the freezer. Ignoring the malfunction is a profit to you. Right? Until the abused machine gives up entirely. This appears to be a validation of Marcott et. al. "A Reconstruction of Regional and Global Temperature for the Past 11,300 Years", Science, March, 2013. And it does, in fact, support that paper's observations, which would be that the Earth is currently in a cooling trend and variation observed over the past 500 years is natural. While it's nice to hear someone in the anti-science group support Mann's "hockey stick" as you have, it would be silly to claim that Marcot (https://www2.bc.e...ence.pdf ) shows we're in a cooling trend or that variation over the past 500 years is natural. Global temperature, therefore, has risen from near the coldest to the warmest levels of the Holocene within the past century, reversing the long-term cooling trend that began ~5000 yr B.P. This directly refutes your claim. Second, what attribution work is in the paper points out that the cooling was likely due to a decrease in orbital insolation (energy from the sun) which was partially offset by increased radiational forcing from greenhouse gases. So the paper does indicate that the cooling trend prior to the recent warming trend was likely partly natural. It does not attempt do much attribution over the recent warming trend, but many others have shown that the current warming can't be entirely natural, either by ruling out the sun (e.g., https://skeptical...ing.html ) and showing that the current warming can be very well explained by the known changes in forcings (http://citeseerx....type=pdf ). There are certainly margins of error, but even with those, anthropogenic forcings are greater than natural ones. The paper has nothing at all to do with Mann's "hockey stick", which predates it by over 10 years. Climate cranks can't count, episode # 85,237,126. Why should we listen to lies? I had to register (no money required but they get my email address and name) with Science to get Marcot 2013. It was no big deal so I did. You can look at anything older than a year. Nice. Open access is starting to get more and more popular. I'd included a link to Marcot in my first post. scholar.google.com can often (but not always) find a pdf version of papers. I'm OK with registering with one of the premier scholarly journals on the planet. YMMV. It's also an act that encourages this sort of thing; all this old research should be available to anyone who wants to read it. It will at least inform the opponents of fake science and give them something to respond to the lies with. Thanks for admitting that you didn't even bother to look at Marcot which, among other things, compares Mann's "hockey stick" to Marcot's results. Since you admit that you didn't even bother to look at the pretty pictures, can you explain why you made up the comment about Marcot?